Year 2016 saw a great start with some really exciting news from the proximity marketing industry. Screenvision, a movie theater management company installed beacons in about 300 theatres as part of their initial beacon rollout, while Rite Aid, a popular pharmacy chain deployed beacons in more than 4500 stores across the U.S. Adding on to that, 85% of retailers are predicted to leverage iBeacon technology by the end of this year. Thus, beacons have now become one of the most promising technologies that brands will look forward to leverage this year. Given that, most digital agencies seem to be busy racking their brains over how they could help their clients set up a proximity marketing campaign that would help identify, influence and convert consumers to sale. Yet not many digital agencies are very sure about the nitty-gritty details about beacons, how they work and things that they need to keep in mind while pitching a beacon project. One of the primary reasons behind this is the lack of content available on mistakes to avoid or best practices that digital agencies should follow while coming up with a pitch for a beacon project. And given the rising demand for contextually relevant experiences – both online and offline, among consumers, not having a proper game plan around how to go about beacon campaigns could cause a digital agency to lose out on customers. In this blog we will discuss in detail about 5 critical facts that every digital agency professional should know about beacons. Following that we will also take you through some of the basic steps on how to get your clients started with their beacon projects. At the beginning of 2015, most of the beacon use cases that the industry and media talked about boiled down to retail. However, over the period of last year, this viewpoint went through some major change as more and more brands across various verticals such as New York City’s John F. Kennedy International Airport, Golden State Warriors – the Californian basketball team, city of Columbus – the first iBeacon city in the U.S, the Mobile World Congress 2015 event etc., successfully leveraged beacons. According to Patrick Connolly from ABI Research, sectors outside retail markets are (and will continue to be) a huge growth area. Looking at our customer base, I couldn’t agree more. To make the most of this opportunity, digital agencies should enable their clients across various non-retail verticals such as museums, hospitals, universities, workspaces, warehouses, hotels etc., to leverage beacons in new and innovative ways by fully integrating them into digital marketing strategies rather than running stand-alone beacon trials. At the same time, it’s also important for digital agencies to realize that though the brands that are generally in news for beacon deployments are mostly the big ones, this doesn’t mean that beacons don’t make sense for small scale businesses. Even if your client runs a small restaurant, he or she could deploy beacons to allow their customers to cut down on something as crucial as waiting time by keeping them in the know-how of how busy the restaurant is in real-time. This can be done by simply deploying a few beacons around the restaurant. Another example of how beacons can be put to use in small-scale enterprises is by employing them to book conference rooms at offices. This can be done by asking employees to install an app and based on information from beacons placed inside meeting rooms, they can check if a room is already occupied or when a particular meeting will be over. One of the popular roadblocks faced by most brands when it comes to leveraging beacons is having a beacon-enabled app in place. It is this very same pain point that gave Google’s Eddystone an extra push during its launch. Marketers all over were excited about the promise that this BLE beacon format made with respect to app-liberation via the ‘Eddystone-URL’ packet that it broadcasts. However, one thing that most marketers at digital agencies don’t know is that there is clear difference in the kind of use-cases supported by iBeacon and Eddystone beacon formats. While Eddystone beacons suit generic location-based marketing use-cases to the ‘T’, iBeacon, because of its ability to work alongside an app is perfect for targeted, personalized marketing use-cases. This is primarily because iBeacon technology has the potential to use customer loyalty information and other customer details such as the their needs and preferences, provided by the app unlike Eddystone beacons. To elaborate a bit more on this let’s take a look at some real-life use-cases that each of these beacon formats were leveraged for. Early this month, Proxama, a company which operates a network of beacons in the UK, launched a new service called MyStop. It leverages Eddystone beacons to send automated transport alerts to users on their Android handsets or iPhones that has the Chrome app installed and Bluetooth turned on, as they travel on a bus fitted with beacons. Users who click on the notification will be directed to a webpage that will update them on the progress of their journey, with real-time updates on delays or alterations to the route according to the user’s exact location. Thus, if your client is actually looking to try some generic location-based marketing use-case similar to this, it might be a good option to consider Eddystone beacons as it allows them to go ahead with their beacon project even if they don’t have a beacon-enabled app in place. On the other hand, the recent beacon deployment by Barneys New York, is a good example of how iBeacon works best for targeted and personalized marketing use-cases. The luxury department store leveraged beacons (iBeacon format) to send notifications to users based on what’s in stock that’s also in users’ mobile shopping bags or wish lists, as well as recommendations based on the content that they recently opened on The Window, Barneys’ in-house publication. While beacons (iBeacon format) cannot work without an app, the need for a popular consumer app can be easily fulfilled by opting for a third party app. In 2014, Macy’s leveraged Shopkick, a third party rewards and deals app to push promotions, deals or discounts to users once they entered the store. But of recent, more brands have begun to leverage popular apps such as Shazam and WeChat that are already installed on the phones of a major chunk of consumers out there. For example, Heineken USA recently revealed its plans to leverage Shazam app to push engaging content to users and tie it back to in-store sales. Most CPG brands, especially the ones in the beer industry, sell through retailers, and apps like Shazam make a difference here by helping them track engagement and determine if a particular tactic actually drove purchase of a pack of beer. One of the questions that most of our clients generally ask us during our initial conversations with them, is whether their users will want to receive such beacon-enabled push notifications. Will it leave them annoyed rather than engaging them? Well, there are certain best practices that brands can follow to ensure that their customers are engaged. We come to that a little later into this article. But beyond that, it totally depends on the target audience that the beacon campaign is aimed at. According to a recent study by Retale, 84 percent of Millennial shoppers respond to push notifications, and 61 percent are interested in promotional offers that can be redeemed immediately. Thus, if the target audience of your client base comprises primarily of Millennials, then leveraging beacons in combination with proximity tools can provide access to interested shoppers at their most receptive times. Most of the agencies who approach us for beacons, generally start off their conversation asking if we could help them set up a basic app that they could use for a quick client demo. Another major factor here is that inspite of the huge hype around beacons, not many marketers have actually seen how a beacon and an app work together. So, if you are a digital agency looking to come up with a pitch for a beacon project, then carrying out a smooth, live beacon demo will play a critical role in making the pitch more convincing. Keeping this in mind, we at MobStac, built our Beaconstac app and made it available for free on the App Store. If you wish to let your client experience a proximity marketing campaign first-hand, without investing any time and money in a beacon pilot project, this app is just right for you! The app emulates a retail store and is built using Beaconstac, a software platform for proximity marketing and analytics using beacons. Now that you have learnt about some of the critical factors that matter when it comes to a beacons, let’s take a look at how to get started with a beacon project. Rather than going ahead with complex use cases, it is a good practice to start with a small beacon pilot, with a limited set of people (volunteers preferably), at say, 3 to 5 locations and test for about 3 use-cases. Once you kickstart a beacon pilot, the most important aspect is learning from it. Therefore, it is highly critical that you analyse the results and take decisions for your future course of action. Firstly, check the adoption rates. Did your visitors or customers bother to download the app? If yes, why? If no, why? It’s important that you ask your volunteers for feedback – what they liked about their beacon experience and what they didn’t. Ask them if they saw any “value add” to their experience or did they find the messages too ‘pushy’? Taking this feedback into account will help you go ahead with your full-blown beacon strategy with confidence. This is the most critical factor. To get your client’s beacon project up and running as fast as possible, you will need one iOS developer, one Android developer and one Back-end developer working on the beacon project, full time. If your beacon project plan does not include any kind of 3rd party data integration (like CRM) then you could go ahead without a back-end developer. To ease your way through this step, your developers could prototype an app from scratch using the boilerplate (sample app source code) provided by Beaconstac and modify it to suit your account. This step comes into play, if you plan to add a little personalization element to the use cases that are being implemented. Ideally even this shouldn’t take much of time, provided you are able to expose APIs of your CRM to a beacon management platform such as Beaconstac. Like we said earlier, it is best to stick to a limited audience and limited number of locations. For example, you can limit the number of customers who can experience how your app works, and how it interacts with beacons. Keeping it a ‘closed’ and ‘limited’ project will help you manage the project better. This way, if you plan to test for say 3 use cases at 3 different locations (each of say 500 sq ft), you will need a minimum of 10 beacons in total. For bigger stores or venues (of say 2500 sq ft) you will need around 12 to 15 beacons per store or venue. This is one of the best practices recommended by experts in order to avoid annoying customers with tons of push notifications. In this method, instead of installing beacons far from the shoppers’ view at the store entrance or on the ceiling of a particular section, beacons are deployed more prominently in stores. For example, Herning Centret, a shopping mall in Herning, Denmark, requires users to ‘ask’ to be beaconed. Instead of pushing coupons to shoppers based on their location in the mall, Herning Centret created two ‘Coupon Zones’ where shoppers could walk in with their phone to receive coupons from nearby retail outlets. In order to capture the attention of the visitors, these Coupon zones were marked with yellow circles on the floor with a banner above. As a part of this campaign, retail stores in Herning Centret provided their customers with some special, time-limited coupons, which were shown via the app at the Coupon zone. As a result, the app saw 1392 downloads over a period of nine days, out of which 665 users viewed at least one coupon thus attaining an engagement rate of 48% among customers. If your client has also voiced a similar concern around push notifications, then employing such pull messaging techniques might be a good idea to go ahead with. 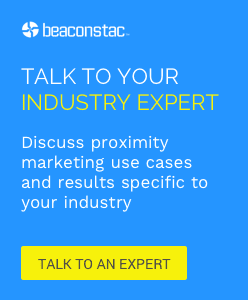 Are there any other aspects that your digital agency would like some help with when it comes to beacon projects? Let us know in the comments below. 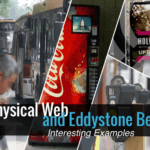 Best of Beacons this Week: Google’s Eddystone – Is it For Real or Just a Fad?